MOVIE FAB: Fantasia Gaining 45 LBS To Play Mahalia Jackson!+Kerry Washington Set To Lead New Shonda Rhimes Drama! After her own Lifetime movie, Life Is Not a Fairy Tale: The Fantasia Barrino Story, back in 2006, Fantasia is now set to play the leading role of another famous singer's life. Gospel legend Mahalia Jackson, who died at the age of 60, will have her life story hit the feature-film circuit, and Fantasia will reportedly be gaining 30-45 lbs to portray her. The Season 3 ["American Idol"] winner is slated to appear in a feature-film adaptation of the 1993 book Got to Tell It: Mahalia Jackson, Queen of Gospel, which recounts the life of the late American gospel singer, a civil rights activist who was also inducted into the Rock and Roll Hall of Fame. The CAA-repped Barrino, whose biggest post-Idol gig to date was playing Celie in the Broadway version of The Color Purple, will portray Jackson on her journey from abject poverty in New Orleans to her rise as a global figure in gospel and early supporter of Martin Luther King, Jr. The film will be directed by Euzhan Palcy (A Dry White Season) from a script by Jim Evering, and goes into production April in Pittsburgh and Chicago for a December release. And actress Kerry Washington has some big news of her own. She's just been cast as the lead in famed director/producer (and fellow YBF chick) Shonda Rhimes' new ABC drama called "In Crisis". This will be Kerry's first regular tv gig, and she was exactly who Shonda and the ABC Studios had in mind when writing the role. The role was one of very few in tv written specifically for an African American lead actor. Actor-dancer-choreographer Columbus Short (Stomp the Yard) is set to co-star in the pilot based on the career of famous crisis management consultant Judy Smith. The pilot, from ABC Studios, revolves around the life and work of professional fixer Olivia Price (Washington) and her dysfunctional staff. Olivia Price is described as something of a legend, a formidable, driven, insightful, intuitive and fearless woman. Short will play a lawyer on her team. The rest of the roles on the pilot are being cast colorblind, which is also how Shonda cast her hit series "Grey's Anatomy." Shonda also created "Private Practice" and the new drama "Off The Map." LOVING this already for Kerry. Congrats to all the YBF folks! NEXT: VIDEO FAB: Erykah Badu's "Gone Baby, Don't Be Long"
Never would have thunk I would find this so iindspnesbale. When its time to lose the weight, i trust that Fantasia looks the same or better than what she did during her first London Concert in 2010! Her body was off the chains!! Best thighs in the business other than Tina turner! Congrats to Fantasia! I hope she kills this role because she's a good singer and actress! 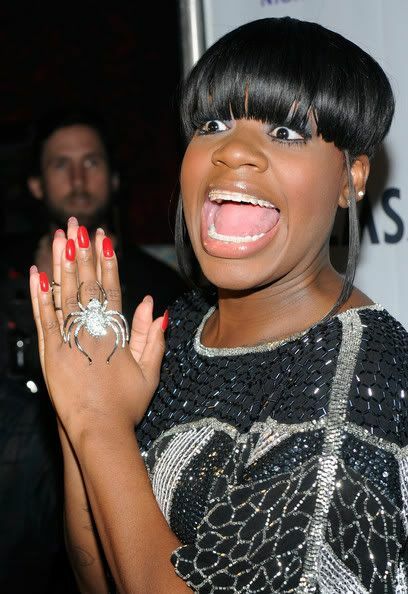 Tasha, I'm sure you can find a better pic of Fantasia than that! Fantasia in another movie! WHYYYYY?? She could barely play herself in that lifetime movie about her life, she was horrible! Gain 45 pounds!!!! She already big. WTF???? Fanny please smartin' up and tell them to make you a fat suit like they do for the white chicks. MY GAWD! Fantasia's speaking voice does not work for Mahailia's rich voice at all. Fantasia sounds like a baby exposed to helium when she speaks. I hope if the role is her's, someone teaches her to lower her register and refine her tone. I AGREE COMPLETELY!!! Hollywood needs to realize that every black person can not play every black role. One Fantasia is DEFINITELY not a match and would not uphold to the beauty essence of Mahailia Jackson's voice in dialogue and DEFINITELY NOT singing. She should have the COMMON SENSE to turn that part down too. Mahailia Jackson had such a refine presence, I'm just saying. Considering there aren't that many black females who can act and sing, Fantasia is a good pick (if she takes long and hard acting lessons bc her Lifetime movie acting was bad.) I think with the weight gain, she will be believable. Jennifer Hudson and Jill Scott would have been good too. Mahalia will turn in her grave. I was born and raised in New Orleans to popular and prosperous family who are well known people that knew well known people, including the great Mahalia. Her LIFE as well as HER MUSIC stood for the glory of God. How dare them get Fantasia of all people to do these role. It really proves that today's generation and America as a whole need the Lord like never before. Fantasia HOPEFULLY has brighter and better days ahead, but in my opinion this role/project should not be tainted by her. And for all ya'll who don't like the pic of her, one: Tell Fantasia to keep her mouth closed unless she singing(or yelling) or two: Give this site the money to buy a better one. Gimme a break please!!!! That's great for Fantasia! She needs something. But seriously YBF...you all couldn't have found a better picture for this girl? I mean come on. Cut her some slack. I wish both FAB ladies the best. They are both talented and attractive in their own ways: damn shame how we love to tear each other down. I will definitely support both of their projects. I really cant see Fanny playing Mahalia at all. Nothing about her says Mahalia. I smell a disaster. I,m sure the people who's paying Fantasia don't feel the same as you. Black people working...gotta luv it. If you're working for Shonda you must be able to act...I'm just saying!!! Fantasia is so pretty to me. Oh, I definitely be watching "Crisis." Kerry's a great actress. Thought she did well on "Boston Legal." Columbus is a good actor too that's growing in the business. Hope she takes a different approach than she did with "Greys" and even "Private Practice." I bet Fantasia is eating everything in sight. I could eat everything in sight and wouldn't gain 45lbs. I'd like to know her diet? I'm sure she's gonna work with some doctors so that she can do it in a healthy way. Why do they want Fantasia to physically gain weight? That's so unhealthy, why not use a fat suit? Mahalia Jackson...That's Fantastic...WoW my mother would have Loved that! MY DAD WOULD HAVE LOVED THIS TO......RIP DADDY. For someone who "blind" cast her roles, a lot of them still go to whites. I mean Grey's Anatomy, you couldn't help a brother out and keep Isaiah Washington? Sorry, I'm still a little bitter about that (even though I still watch the show, I can't deny it's good for the most part). But I guess I should just be happy some of our African-American actors are getting a steady paycheck, that's more than I can say for myself....sigh. With all due respect, Isaiah did himself in. He was given a second chance and his arrogance and big mouth just had to keep it going. Do not mess with the gays in Hollywood, that is a powerful group and he was attacking the actor that played George, a loveable character. I was sad to see him leave the show and it fell off in appeal for me, however you cannot blame Shonda for that. I'm so happy for Kerry! Let's support our fellow YBF chick so she can get killer ratings. Getting a black, female lead on network television is long overdue. Congrats Ms. Washington!